Journalist, trainer and psychologist, Mirela has worked in the media and education for the last 15 years. Her background takes in psychology and counselling, journalism, teaching, coaching and media training. Mirela is publisher and the editor in chief of Global Woman magazine and the organiser of Global Woman Summit. She is also the creator of Migrant Woman Platform and the organiser of Migrant Woman Conference. 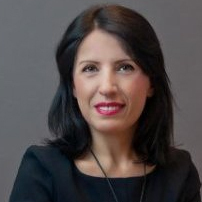 Mirela is a coach, trainer, speaker and also studying for a PhD research in Psychology at Regent’s University. Mirela is also author of several bestselling books. Her last self-help book ‘Don’t Let Your Mind Go’ is published in America and Turkey. Mirela was a regular presence as the resident psychologist on the Public TV Channel, and panellist show called Love Story. Lately she was invited for the Headline Interview at London Live TV. In 2014 Mirela was selected as one of 10 Women Entrepreneur Leaders for Women’s Entrepreneurship Day by ICSB. Recently she received the “Inspiration Award for Women 2015” for Human Rights. She can train clients in groups or individually from their own premises. She is available for building confidence sessions, finding inspirations, career coaching, communication skills coaching, conference presentations to home and international audiences.